“Everyone I love just says goodbye. I don’t know why I try, when I get heartbreak again.” Although we don’t need another one, here’s a love concept album. Yet like the much-talked-about BBC drama series Killing Eve, for which this trio of talents recently composed the soundtrack, Unloved (vocalist Jade Vincent and composers Keefus Ciancia and David Holmes) have created a gripping, immersive experience with their second captivating album Heartbreak and it’s one that paints a portrait of the ubiquitous subject of love with an exciting retro-tinted multicoloured shade. 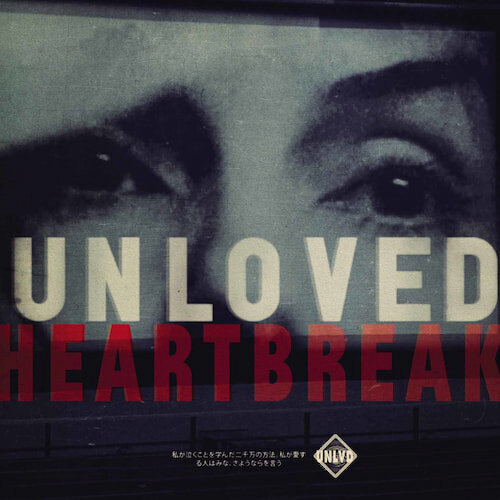 Much like their debut, 2016’s Guilty Of Love, Unloved’s new record ‘Heartbreak’ is drenched in the shade of 60’s music inspiration. It’s inspired by different genres from that era. From atmospheric folk to girl-groups to experimental psychedelia. Although much of their compositions are reminiscent of soundtracks from that decade, both from television and cinema. Examples include the lead single ‘Love’, which features a dramatic arrangement of sharp trumpets and rolling tribal drums that borrow from the style of Henry Mancini‘s The Pink Panther and Peter Gunn. ‘Crash Boom Bang’ – where the protagonist is lost at sea – also contains Mancini drama but pairs this with the reverse tape effects used on The Beatles 60’s album Revolver. The mysterious jazz-drum, haunting choir track ‘Danger’ begins by sounding like The Addams Family theme if composed by Bernard Hermann before transforming into the POW! POW! scenes in the comical Adam West-starring Batman series from that era. ‘Remember’ sounds more associated with the horror movie genre, containing the kind of occult chants that could be voiced in Roman Polanski’s 1968 film Rosemary’s Baby. One of the most fascinating elements of Unloved though is the vocal and writing talents of Jade Vincent. Her voice is both welcoming and spine-tingling. Her lyrics and voice are diverse as she occasionally changes narrative and personality. Vincent narrates from the 3rd person about a love story in the ecclesiastical ‘Boy and Girl’. She begs directly to her lovers to stay with her on the cinematic-folk tracks ‘Lee’ and ‘Love Lost’ – which equally sound like they could belong on Julia Holter’s latest record Aviary and imagine the echoey lonesome environments of Nancy Sinatra and Marianne Faithful. Yet her persona switches to malicious on the hypnotic ‘Fail We May Sail We Must’, taking on the role of a suicide pact leader: “”Calling all lovers! Save your soul! While the fire is hot. Bathe in the glow. Bathe in the fire.”. Her voice swirls around like a chaotic ghost in limbo. Jade Vincent’s best tracks are ‘Bill’ and ‘(Sigh)’. The latter is an apt title as sighing is one of the many voice techniques she uses on the most spooky track on the record. Her vocals are as unpredictable as the unsettling environment around her. She also takes heavy breaths and grunts. It’s also one of many songs to add the extra dimension of samples. With an African chant on this particular track, the sound of a formula-1 racing car speeding on ‘Devil’s Angels’ and looped crowd-whistling on the opening Cults-like title track ‘Heartbreak’. ‘Bill’ is the most understated track on the album. It’s simple slow-dance-at-a-school-prom pace is made chilling by its lyrics. Jade Vincent recalls the death of her father and it sounds as if she’s desperately pleaing to the grim reaper asking him to spare her father and take her to the afterlife instead. “Don’t take him, he’s no good. Trust me, I’m better. He’s too lovely. Take me, I’m bad. He won’t entertain you like I would”. Its pairing of a sweet sound with macabre lyrics are similar to Mitski’s ‘Two Slow Dancers’ from last year. Due to the album’s hallucinogenic production, occasionally-paranoid lyrics and the way tracks fade into each other seamlessly, it feels like listening to the soundtrack to one’s own long continuous dream. It should contain the warning: listening to the follow record can cause trance-like states. Heartbreak is out now on Heavenly.